One of the most common reasons an underground oil tank is removed is either due to corrosion or simply because it’s old. As the tank begins to rust, it can degrade to the point where it may start to leak, contaminating the soil that surrounds it. If this were to happen, then be prepared to whip out your credit card as the costs to remedy the issue at hand can cost thousands of dollars. 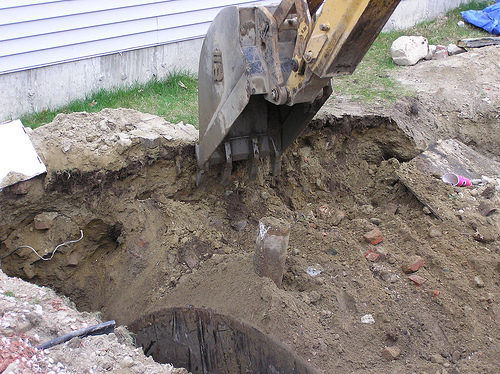 The costs to remove an underground oil tank will be dependent upon various factors, including the location of the tank, the size of the tank, permits required, the contractor you choose and your geographical location, to name a few. In a moment, we will go more in depth in regards to how each factor can affect the costs and what you should be prepared to spend when hiring a professional to remove your underground oil tank. As there are so many factors, the estimates we gathered online could vary anywhere from as little as $2,000 for a basic job to more than $4,000 if in a complex area, but for the most part, the basic cost, as long as the tank is not beneath the home, will be around $2,000. As there are so many factors, it is hard to offer an exact estimate. For that reason, we do recommend HomeAdvisor.com, a contractor-based website that simply connects you with a professional in your area. Here, you simply describe your job and multiple contractors will contact you with a free, no-obligation quote. Oil-Tank.com, for example, states the average tank removal is relatively inexpensive, often costing about $1,900, but if you required a contamination cleanup, the costs could be in the $20,000 range. According to one member on this City-data.com forum thread, he paid $250 to have the soil tested and another $900 to have it removed; however, it did claim they didn’t really remove it; instead, they dug down, exposed the top and filled it with an inert substance after the oil was pumped out. Leaking? Fees mentioned above PLUS $10,000 to $30,000+ for cleanup, depending on the contamination. The tank location: An above ground tank is much easier, of course, but this guide isn’t about this type of tank, unfortunately. Seeing an underground tank is, well, underground, it’s going to cost more, but where the tank is located can affect the cost. For example, a tank beneath dirt and that’s it will cost much less than a tank located underneath a concrete driveway or in an area which requires heavy machinery and/or special machinery in order to access tight corners. The size of the tank: Simply put, the larger the tank is, the more the contractor will have to dig in order to remove the tank completely. Smaller tanks, as you can imagine, will be much easier to remove, when in comparison to a larger tank, especially if it requires special transportation to take it away from your location. Permits: All geographical locations will vary in regards to which kind of permits you will need to pull for the job. Usually, in most cases, you will need a permit to remove your underground tank, and the permits, depending on the local code, can be a few hundred dollars on average. These permits need to be pulled to ensure you’re working with a registered and licensed contractor in your area. Liquid Disposal: All underground oil tanks will have some sort of fluid left over in it and will need to be disposed of appropriately in a safe way. Since you cannot just dump the oil in your yard, special equipment will be required to safely and legally dispose of all leftover oil. Lab Analysis: In the case of a leak during the removal, you may need to have a laboratory analyze your ground (around $350) to make sure none of the surrounding soil/ground is contaminated. This isn’t always needed, but it may be wise to budget for it in a worst-case scenario. If in the case the oil tank did leak, then you may need to budget a low ten figures for appropriate cleanup. In some cases, if no leaks are suspected, you may be able to consider an alternative route by digging down into it, chopping off the top and filling it with an inert material such as pea gravel or cement. Again, this can only be considered only if the tank shows no signs of leaks. Check your state to see if any grants are available to help offset the costs of removing the old oil tank and installing a newer one. For example, a member on a Zillow.com thread online claimed, at the time, New Jersey was offering a $1,200 grant for removal and another $1,800 for the installation of a new tank. Some companies will front the grant money so you do not have to wait for the savings, but your results will vary depending on the contractor you do hire. After the removal, your insurance carrier may lower your premiums once you prove the tank is removed, which is often ton via a Letter of Closure. Even in the event of a leak, most insurance companies will not cover the repair as there is a “pollution exclusion” clause in most contracts, freeing the company from this responsibility. Know your state laws when it comes to an oil tank removal as all states will vary. For example, in Michigan, they require all underground oil tanks must be properly closed and removed withint one year of its last use unless removing it could do damage to the structure. In New York, all underground tanks must be emptied, cleaned and emptied of all vapors, with written proof the tank was abandoned. A decayed shift, overfilled tank, lack of maintenance, leaky fittings, severed lines and/or negligent oil delivery are all common reasons an underground oil tank can leak. How can I tell if the tank is leaking? There are many signs which may point to an underground oil tank that could be leaking. Signs to look out for include a higher-than-average fuel consumption, even when not in use, dead vegetation around the tank, strong oil odors near the area, a strange well water taste/odor, darker soil than the surrounding yard near the tank, a stained area around the fill pipe and/or water is present in the fuel lines. If you do notice any of these signs, you will want to contact a contractor right away before the contamination becomes worse, costing you even more money.